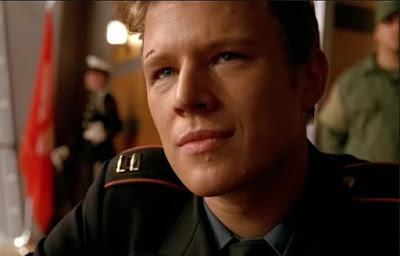 After watching tonight's episode of Kings, "The New King: Part One", I must immediately say: "Oh, Jack. How long have you been dealing with cutthroat political manipulators and you once again manage to be blind-sided by one of them?" *SPOILER ALERT* But let's begin at the beginning. This episode really needs a graph, or a flow chart, or something, because our heroes and villains kept switching sides left and right. Or at least it seemed that way. Last week I wondered what became of David (Chistopher Egan), after Jack (Sebastian Stan) defended him in court and then slipped away with the help of Uncle Willaim (Dylan Baker). Abaddon plays a pivotal role here. 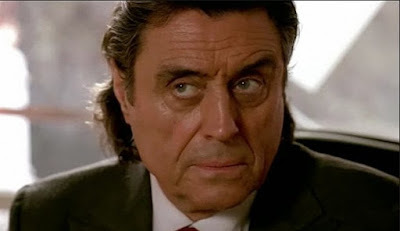 After the debacle of David's trial, King Silas (Ian McShane) seeks out Abaddon for advice. I love that Silas tests Abaddon's mental faculties by seeing if he can identify the wine they're drinking--which he can. Abaddon advises Silas to take a firm hand in his quest for peace. He says Silas always worried too much about the love of the people; he should not be afraid to rule by fear. "They already think me a tyrant," Silas says, and Abaddon encourages "You're not a tyrant. But you could be." Silas takes this advice to heart. He takes a hard line on the handover of Port Prosperity to Gath, saying that anyone remaining in their homes should be arrested--or shot. He threatens his ministers into compliance. 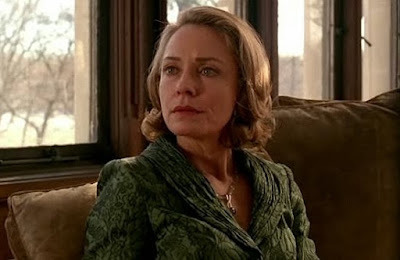 Meanwhile, Queen Rose (Susanna Thompson) works her manipulative magic. She seduces Silas in the board room, then uses his distraction to "ask" for forgiveness for Jack. She gives Silas the pros and the cons, which basically amounts to one of her carefully engineered threats. Rose then advises the guilt-ridden Princess Michelle (Allison Miller) to forget about David and move on. When Michelle persists in pursuing the matter, Rose tells her to offer the king something good when she begs for David's life. I have to give Silas style points for his response to Michelle's query about David's location: "He's in a temporary location underground, until we can find him a more permanent place there." Ouch. The princess offers to be seen with another man in public, to show no favor to David. Silas does not relent on the death sentence, but he allows her to visit David. David is understandably angry at Michelle, and feels betrayed. I find it interesting, however, that he takes the same hard stance that Silas recently took against him--he won't even bother hearing her explanation. The difference, of course, is that David only lied about a relationship to Silas, and Michelle lied about standing up for David against a death sentence. Once she's gone, Abaddon has a chat through the vents with David. 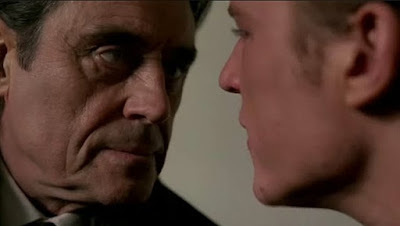 I am as bad as Prince Jack, it seems, for I was surprised when Abaddon said he'd been up to no good with Silas. He tells David the opposite of his advice to Silas--that ruling by fear had been his mistake. He says that death is nothing to be afraid of, that to die knowing you are loved is enough. David drily replies that he'd rather be alive and miserable, which gets a laugh out of Abaddon. Silas doesn't make it easy. He orders Jack to his knees, which Jack does with extreme anger in his eyes. But then Silas tells him to kiss the ground that he walks on. Rose protests, but Silas adds insult to injury by telling Jack "Your mouth has been in dirtier places." 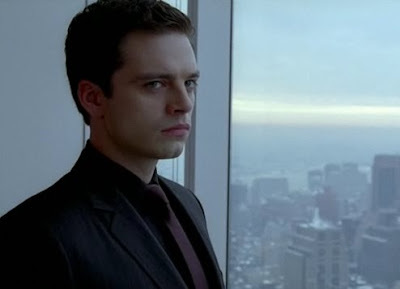 Sebastian Stan once again does an amazing job as the conflicted and consistently tortured Jack. 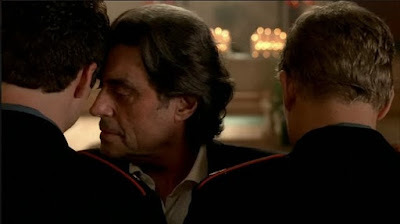 His eyes on fire, his whole body tense with anger and humiliation, he brings his lips to the ground and kisses the tile at Silas' feet with an audible smack. Silas then tells him that his mother has given him life twice--and that it won't happen again. You can feel the tension in the room as everyone tries to find somewhere to look other than at Jack. Rose tries to comfort him, but he shrinks from her touch. The big event happens, then, the transfer of Port Prosperity. As the representatives from Galboa and Gath meet, we see David being led out to a firing squad. As he asks God to grant him peace, like the peace he fought so hard for, we see Silas telling the crowd and cameras about his own movements for peace. Prince Jack looks up in the balcony to see his scheming uncle and nephew Andrew (Macauley Culkin), waiting for their plan to take shape. These parallel scenes have parallel gunfire. David opens his eyes to discover his firing squad has been fired upon, and he still stands alive. At the ceremony, a lone gunman starts firing at Silas, and Jack dives in front of the bullet. He's hit, but so is Silas. After the dust settles, Reverend Samuels (Eamonn Walker) comes to inform Queen Rose that the king is dead. She doesn't believe a word of it, unable to face that her indestructible husband could have been killed. Jack arrives, arm in a sling, to take his rightful place. For once he gets to scare his mother with his cold efficiency, as he kisses her on the cheek and recites some of her own advice about appearances back at her. One point for Jack there, at least. Next we see Jack welcoming David back from death with a hug and a smile. David is understandably wary, wondering why Jack saved his life. Jack tells him that he plans to lead in the best way possible, and he needs someone good by his side so that he can learn from his example. David is still uncertain, but he goes along with Jack to the board room to meet with the ministers. Upon seeing David, Michelle is struck speechless, and David gives her a cold look worthy of her family. David is about as pure as you can get in Gilboa, but in Kings, everyone has a little darkness. And now we are back to Jack. He settles comfortably into the king's chair, and makes the pronouncement that he plans to work for peace just as his father did. Before he can get very far, however, his uncle William interrupts. He's had enough of the pompous speeches and posturing, and is ready to get as bloody as it takes to wipe Gath off the map. When Jack tries to protest, the room is suddenly surrounded by armed guards with guns at the ready. Once again, Jack is just a pawn in someone else's game. Just when it all looks hopeless, William's creepy nephew Andrew sneaks up behind him. I swear, I was hoping he had a gun or a knife and was going to give his dad what he deserved. But he only has a message: that Silas has disappeared, his ambulance waylayed. Queen Rose's eyes light up...she knew her husband could not so easily be dead. Princess Michelle sidles up to David, and he listens to her long enough to find out that she can help him escape the building. I'm not sure why the horde of armed guards would let them just wander off to a hidden corner of the room, but I suppose they might figure they had no place to go. Creepy nephew Andrew follows them, and sees David leave, but does not sound the alarm. David of course knows where the king has gone, as they went on pilgrimage together. He finds the king with his girlfriend and son--and the ever-faithful Thomasina (Marlyne Afflack), who pulls a gun on David. But once again, David does not waste time with petty revenge. He thinks only of the kingdom, only of the people. David lets Silas know that Jack is in place as king, but only as a puppet--that William will destroy everything that Silas has built. Suffering from his wounds, looking wild-eyed and beaten, Silas claims he is done, that it is all over. I love that Thomasina gives David a look that says she's as disappointed as he is. And she does nothing to stop him when he confronts Silas nose to nose, to throw at him all that he's done and all that David tried to do, and what Silas owed his own people now. At his passionate speech, Silas's eyes grow clear and determined. He tells his young son, "Remember when I told you that I worked for the king? Well...I am the king." So will Silas be the new king, a king reborn through circumstances and David's will? Or will Jack maintain the throne, with or without his uncle's interference? Or will David become the king the divine butterflies indicated he might be? Other questions that circle...what will Andrew's role in all this be? Will David be able to forgive Michelle, once he learns her reasons? And will we finally discover what Jack's true motives are--will the good in him win out over the ambitions? Jack's mother wanted to know how much he was involved in the plot against Silas, and I'm actually curious myself. Was Jack supposed to throw himself in front of the bullet to make a good show for the cameras, or was it a genuine impulse to save his father? Tune in next week for the final Kings, Saturday night at 8/7c. We'll see how many answers we get, and how much will be left to our own imaginations. Read more of my Kings blog posts. 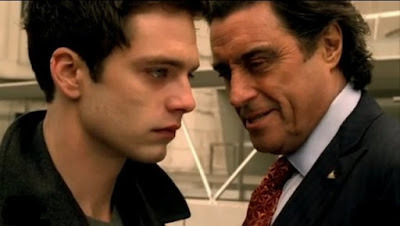 PHOTOS: Sebastian Stan as Prince Jack Benjamin; Ian McShane as King Silas Benjamin; Susanna Thompson as Queen Rose Benjamin; Prince Jack and King Silas; Christopher Egan as David Shepherd; Allison Miller as Princess Michelle Benjamin; King Silas and David; Prince Jack, King Silas, and David, Kings "Goliath", "Brotherhood", and "Javelin" screencaps, c2009 UMS, NBC.